I have been looking at validation for my current project. We are building an MVC 3 site that calls a wcf service later that is wrapped around Crm 2011. Initially I was looking at data annotations out of the box. These work really well and MVC 3 works seamlessly with these with client validation and unobtrusive JQuery. This is a very user friendly clean way of writing validation on your entities in the same way that data annotations are written. The difference came when I started to look at rule sets which you will see in my attached screen shots. As you can see there are no data annotations and ContactForValidationPOC has a complex property of Addresses. This tells the class that there is a validator class call ContactValidator somewhere. Also please note that I have referenced the correct Fluent  validation dlls in my project. You can see that we have 2 rule sets. The first is a staff rule set and the second is a public rule set. They are quite similar and the only difference really is that the Age must be over 18 for a staff member. Both rule sets also use a .Must predicate validator. This is a great place to put more complex logic. Here we need to ensure that there is at least 1 address in the Addresses collection that is marked as IsPrefferedAddress. Ok, so that is all done, now we need to unit test or validation rules. So I have a unit test written here. Firstly I set up a new ContactForValidationPOC entity and add a couple of addresses to it. and then do a simple check for the number of validation errors. Obviously my test could be more detailed in a real world example. and it has a collection of validation errors on it. This is good as we didn’t enter a first name, our Age is under 18 and we set all AddressForValidationPOC’s in the Addresses collection to IsPrefferedAddress = false. Ok so we now know that our validation is working correctly on the server side. We haven’t even touched the MVC code yet. Note: they should be set to false to prove that server side validation is still working correctly now that we are validating through MVC. You can see that, when debugging the controller we get the same validation results. IsValid = false and a number of errors relating to our Staff rule set. We could use some logic to check what type of rule set to load, staff or public. 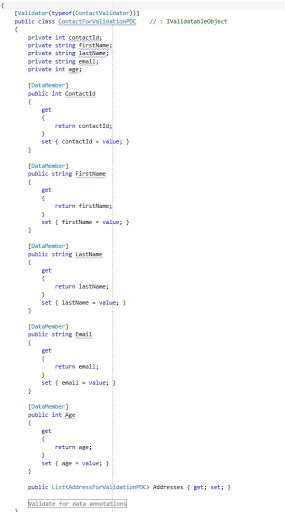 Well that is it, a high level explanation of domain entity server and client validation using Fluent, unit tests and MVC. All the validation for an entity is contained wholly on the entity. Fluent validation is very easy to write and read. More more complete business rules you can use a predicate delegate. You can unit test your entity validation results with ease. It works seamlessly with jquery.validate and jquery.validate.unobtrusive. Cant think of any more at the moment. I have used EF for a while. I am used to using an EDMX file for my model. I have also recently used Code First and the DbContext API and I really like this. Last night I started building an app. and was thinking, am I starting on the right foot? Do I use EDMX or DbContext API? If the thing i’m building turns out to be big, will I have chosen the right technology. What if I use DbContext API and get it to generate my database. Obviously I don’t want this to keep generating my database down the track when i’m at a stable point in development (or do I?). Then if I want to tweak my database or domain model will all the strings come un done? The DbContext API is a simplified version. Will it do everything I need? I dont think ill need stored procedures as I can do everything with linq. So my real question is. If I am building something that is serious and out there is the real world and it may turn out to require some complex coding, which way do I go? EDMX or DbContext API? Is EDMX now old school?